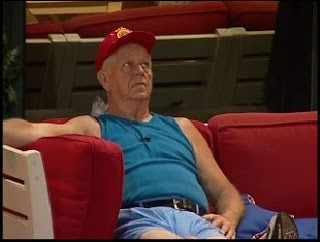 Big Brother Gossip: Jerry's "Injury"
Off and on today, Jerry has been complaining about his neck. Yet, it's always at convenient times, and he usually does something right after that contradicts the extent of his pain. I have a feeling it's some dastardly plan he's created to save himself. Yet it might be working. Memphis pointed out that he's in pain to Dan, who wisely wondered if he was faking. Edit: Hahahahaha - since nobody was paying any attention to his ice pack, he disposed of it and started playing pool. this guy is loosing it. more importantly..who could keep an ice pack on all damn day?? his skin is either dead or he is! i saw him lifting weights today!!! and yesterday i saw him using his rubber band exercising thingamajigs in his room. Please Jerry go ....nurse your neck and everything else you can! Just go this week!!!!!!! Indeed! And he is losing it, as well.